Plenty of comic books start with the hero discovering the ability to fly. Skip Martin's Bizarre New World is unique, however, in that instead of putting on a cape and fighting crime, Martin's protagonist Paul Krutcher deals with the more mundane aspects of flight -- what his co-workers will think, how to avoid getting struck by lightning, and how to contend with his jealousy when someone else announces they could fly before Paul could. With spinner racks full of superhero slugfests, Bizarre New World (and it's new graphic novel sequel, Population Explosion) is a comic book with nary a punch thrown, one that dares to examine the practicalities of super-powers -- and in that way, some of the majesty that makes superheroes so compelling -- without the mindless violence that sometimes weighs comic books down. Population Explosion picks up at the end of the first Bizarre New World series, as Paul barely has time to register his jealousy of fellow flyer Matthew before the rest of the world develops flying powers as well. A world-wide miracle quickly turns to chaos as budding flyers find themselves in dangerous situations. Paul receives a desperate voicemail from his son, sending him on a cross- country rescue mission -- but flying at top speeds turns out to be harder than it looks. The best part of both of Skip Martin's Bizarre New World tales is that Martin just "gets" the way normal people would act in extraordinary situations. In the afterword, Martin dismisses the moment that people begin peeing from the sky as a "shameless urine joke," but it's an unexpectedly real moment, as is the image of the background character who's already wearing a super-hero T-shirt for just this occasion. One can't help, as well, to fall in love with Paul, who's tendency to fall asleep at work is balanced by his concern for how to get footprints off his ceiling, and his love for and late-night lightsaber duels with his young son. If the first Bizarre New World's intention was to look at how one man would deal an extraordinary moment, Population Explosion examines how we as a society deal with unexpected world-wide events. The crux of Population Explosion is a ten-page conversation between Paul and the waitress Marie -- who's still watching her restaurant after everyone else takes to the air -- where Marie compares the flight development to September 11. Marie recalls wondering on September 11 when the first television movie would be made, a thought later borne out; the point she and Martin are making is both how disengaged collective society has become from the emotion of the moment, and also how cynical the individual has become in expecting that disengagement. It's a point that's both relevant to the issues of the day -- Hurricane Katrina, the war in Iraq, an election that's become more media ratings circus than democracy -- and also to the superhero comic book genre. We've become so used to a flying man on the cover of our comics that we've stopped being awestruck by the possibility of a flying man, a point similarly made in early 2000s Superman comics. By offering a fantasy comic book that doesn't degenerate into fight scenes, Martin reimbues super-powers with some of their original grandeur, and avoids the somewhat tired paths travelled by other "normal man" stories like Heroes and others. As a graphic novel, Population Explosion is an interesting, thoughtful tale, but Martin's talent is obviously in his dialogue, and at times the action suffers. There's a four-page sequence of Paul leaving the city, accompanied by gripping radio narration of the tragedies happening elsewhere in the world; while this would have been gruesome, it might have been better to see these scenes rather than just hear about them, or even to have Paul face more peril of his own. 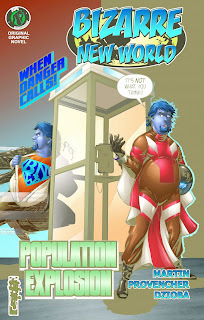 At times it's a bit too easy to see the writer pulling the strings -- Paul decries how his phone "always" goes to voicemail when he misses the frantic call from his son -- though Martin makes up for it with the depth of the characters. Compared to other graphic novels out there, the $6.95 price for Bizarre New World: Population Explosion seems a steal, and the ways in which Skip Martin's Bizarre New World differentiates itself from your everday comic book deserves a look. For more information, visit the official website, www.bizarrenewworld.com. On now to reviews of the Jack Kirby Fourth World Omnibuses, and more. Stay tuned!